Earlier this month, Convicts & Cthulhu attained a small but significant milestone — it’s first appearance at GenCon Indy. This notable achievement came thanks to the hard work and diligence of Matthew Ruane, the newest member of our C&C writing team. 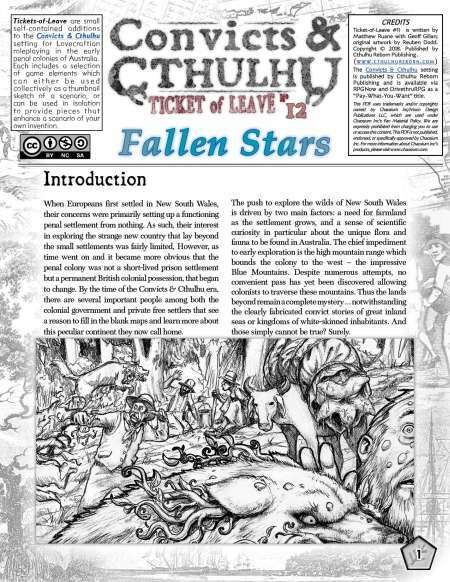 Matthew has a long and enviable track-record at running memorable GenCon games, so we were absolutely delighted when he expressed an interest in adapting for con-use the material previously published as Ticket of Leave #12: “Fallen Stars” (free PDF download link). We were curious about how GenCon gamers enjoyed the challenge of a convict-based horror scenario set in the early history of Australia, so we asked Matthew for a few impressions about the experience. We were most surprised when he came back with a full and detailed retrospective analysis of the whole affair (see below, in blue). I guess that’s professional writers for you! As the author of Convicts & Cthulhu Ticket of Leave #12, “Fallen Stars,” I informed Dean that I was planning on running the adventure twice in Indianapolis at GenCon in August 2018. He readily approved and encouraged me to give Convicts & Cthulhu its first “semi-official” GenCon appearance. Dean also was generous in providing 12 copies of the rulebook to be handed out to the players so they could become emissaries for Convicts & Cthulhu with their own roleplaying groups when they returned home. Having run Call of Cthulhu sessions numerous times at GenCon over the last several years, and generally having great feedback and support for the adventures I ran, I expected this time to go off without a hitch. In writing and drafting the adventure, I had playtested it with a couple of different groups and got feedback from the players on where to improve the adventure. Dean and Geoff also provided feedback on where the adventure could be strengthened, and since this was designed to be run at a convention I was pretty confident that it could fit within the four-hour timeframe allotted. A few weeks prior to GenCon, I designed 15 characters with brief backgrounds who would be part of the expedition. Because I was unsure of the gender ratio of the players, I created male and female versions of several of the characters to be used as needed. Approximately 8 player-characters (PCs)—Lt. Morrant plus 5 male and 2 female characters—were therefore available for each session. The PCs were a mix of soldiers, free settlers, and convicts at various stages in their sentences. There was also a common character Lieutenant Morrant, the expedition leader, for both groups. Based on prior experience with at least one strong player willing to be the leader, I thought this would be an ideal solution: a player to lead the expedition into the unknown and push the group forward. My first session on Thursday afternoon had five of the six players show up. When no one appeared with generic tickets to fill the empty seat, we started. I started up my iPad with some Australian Aboriginal music in the background and began with the brief setup. 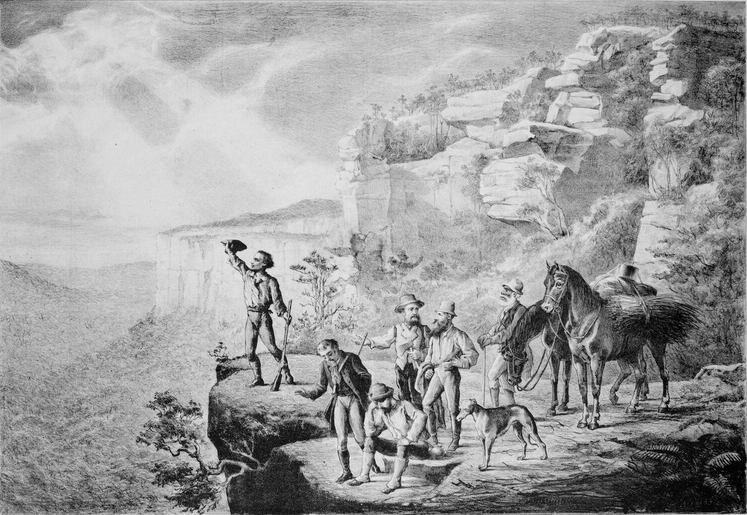 The group asked for some extra labor, so I provided both Lt. Morrant with four additional soldiers, and Gribbin, a convict miner, with a half-dozen laborers he was responsible for overseeing. The party continued along the adventure, pushing through to the first real encounter at native village and a sick Aboriginal warrior who had brought back a mysterious canister. They played around with the sealed canister, eventually forcing it open, and infecting at least three or four of the non-player characters (NPCs) with the spores. Having been warned that the canisters contained spores, they were now much more cautious when they got to the dig site. For about an hour, the first group explored the dig site, recovering pieces of meteorite, investigating dead infected Aboriginal men (and in the process, getting more of the group infected with spores). Lt. Morrant’s player decided to play him as very upper class, opposed to doing physical labor, and had Morrant watch from atop the small hill overlooking the crash site, largely because Morrant had also failed a number of sanity rolls earlier in the game and was on shaky ground. Eventually, the other PCs discovered the shoggoth container inside the crashed meteorite. Curious as to what was in the sealed container (they knew what was in the blue marked ones), they forced open the canister, which popped out the proto-shoggoth they were ill prepared to deal with. From there, things went down hill very quickly. The proto-shoggoth quickly consumed most of the NPCs, drove a few of the PCs insane who then in turn ran off or hid in their tents at the campsite. The survivors eventually rallied and decided to abandon everything to make it back to Parramatta as quickly as possible. But without supplies, and with several of the PCs insane and one player taking on the role of a surviving NPC soldier after his PC was slain, they spent the final hour making their way home. When they were attacked by the infected dingoes, several more PCs fell to insanity, and others were seriously injured and infected with the spores. In good Call of Cthulhu roleplaying, the players knew their characters were likely doomed. They placed all hope in making it to the Aboriginal village for aid and assistance but instead found the village abandoned. They left the most injured behind, and four infected survivors made it towards Parramatta. 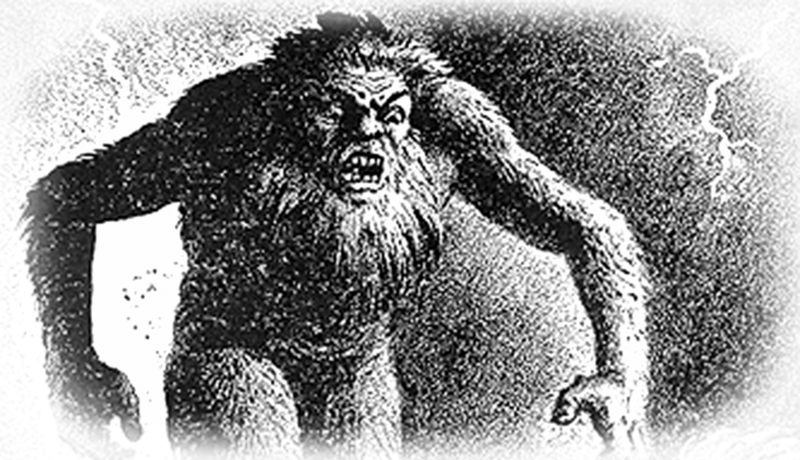 As we were running out of time, I skipped the Blue Yowie encounter, though the sounds at night drove them to push through the bush continuously. As the infection began to take hold, two more PCs (one of whom was Lt. Morrant) stopped and shot each other as blue tints in their eyes appeared and signs of the fatal infection became obvious. That left two single PCs to make it to Parramatta, one of whom was clearly infected and the other appeared to have avoided infection (according to the rules, they managed to fight it off with a series of miraculous rolls). The game ended with the two survivors telling the authorities what had occurred, but since they were both convicts, they were imprisoned until their stories could be verified. The second session on Friday night played out very differently. This group consisted of two couples and a single male player. Since we were one player short, I asked if I could play this with a slight difference, making Lt. Morrant an NPC. They readily agreed, and this session ran a lot better than the first. I let Morrant remain in the background, but since one of the PCs was a sergeant in the NSW Corps, there was still a leader in place. However, he was in many ways more equal to the free citizens in the group. Morrant as an NPC made some hard decisions, but there was often spirited debate. Regarding the backgrounds of the players in this group, I had run a Call of Cthulhu game for one couple a few years earlier, and they had come back specifically because I was the GM. The second couple had flown all the way from Australia (they were from Queensland) and were regulars at GenCon. It was sometimes intimidating playing for the Australians, but they were good-natured in correcting my pronunciation of Parramatta, and they also provided some local color to help establish the background and sense of being in the Australian near-outback. The fifth player was an American, and he played the NSW Corps soldier. Since there were two women playing in this group, I had one female PC, while the other played a male PC. This group of players, mostly in their early 40s or older, worked well together when the scenario called for group interaction. Now this session was also different because the players spent additional time enjoying roleplaying. When they got to the Aboriginal village and then the crash site, they were much more thorough investigators. They managed not to open any of the canisters, though they did collect them along with significant parts of the meteorite. They spent about an hour at the crash site, and they managed to get the entire expedition back with only a single loss of life, this time being an NPC soldier. They even took precautions, wearing gloves and tying scarves and handkerchiefs about their faces, as they dragged bodies to be burned. It was efficient and tidy, and I was starting to wonder if they would make it back to Parramatta without being infected and even managing to bring the proto-shoggoth container back intact. However, this time it all went pear-shaped with the dingo attack. 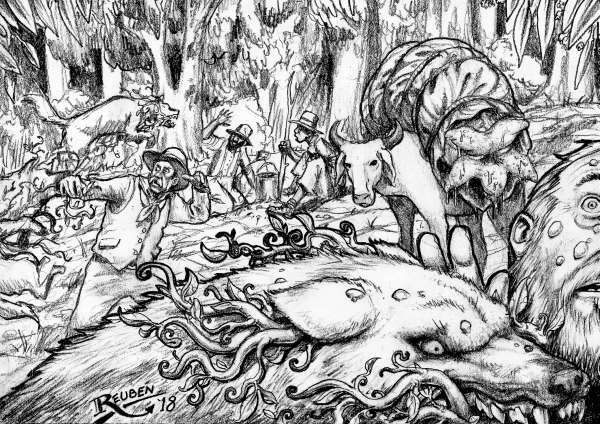 Several failed rolls for attacking gave the dingoes the chance to bite and infect not only the NPC soldiers but also a few of the PCs. For the first time, sanity rolls failed in rapid succession, and temporary insanities took hold. Morrant started to throw canisters at the dingoes, and one of them burst. 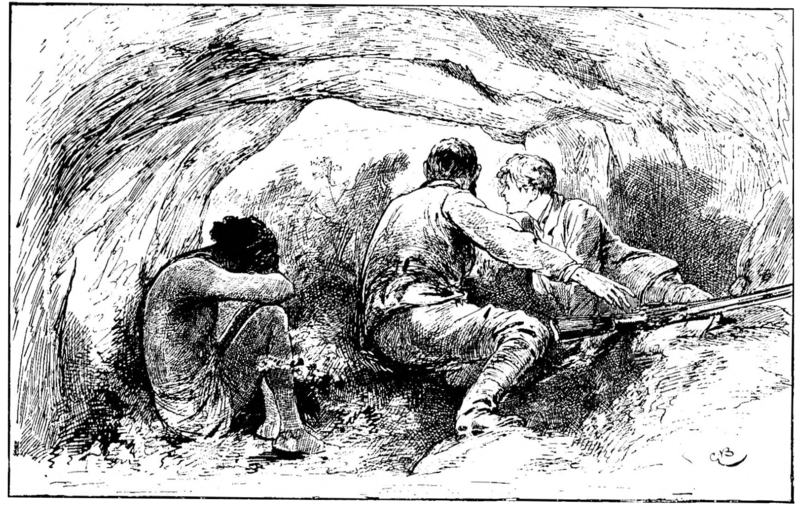 The PCs and survivors, having slain the attacking dingoes, hurried off to the Aboriginal village with a restrained Morrant and several soldiers showing signs of infection. They decided to then leave behind the wounded, and they would come get them when they could. They next day the proto-shoggoth container burst. When the creature escaped, more sanity rolls were failed (several quite badly) and the PCs ran. The proto-shoggoth feasted on one of the NPCs, and the others ran off into the bush. They spent about 20 minutes in game time before the remaining survivors came back together, minus most of their supplies, and with a single haversack full of meteorite pieces and alien technology. They also had numerous paintings and sketches so they thought they had enough evidence to present to the authorities. This group encountered the Blue Yowies. At the description of the creatures, the two Australian players nodded their heads and later mentioned that they sounded like the tales their grandparents had used to frighten them when they were misbehaving children. Though the Blue Yowie attack was pushed back with fire and gunshots, the PC Sergeant died and the player took over one of the remaining NPC soldiers. The others were slowly infected and showing some signs of infection, but two of the PCs managed to hold back the infection after displaying initial symptoms. All five made it back to Parramatta. Without Morrant or any other representative of the NSW Corps, it came down to the free settlers and the disgraced nobles to convince the authorities of what happened. It well after midnight when this session ended with smiles and a brief post-game discussion. There were several lessons from this. I spotted a couple of (minor) editing mistakes in the pdf copy of the adventure that I need to fix. As for running the game at the table, I recommend that Morrant be an NPC, and that the players take on the roles of the other PCs. The first group did well with a player as Morrant, but they were often hesitant to make hard decisions when it affected other players around the table. With the second group, partly because two of the players were English and two Australian, there was good-natured banter and back-and-forth jibes, while the other American and I watched and listened with amusement. I look forward to running at least two more sessions of Convicts & Cthulhu at GenCon 2019. Hopefully, a few more readers who are also GMs will step up run some sessions next year, and perhaps if the stars are right, Cthulhu Reborn might have a formal presence so brief sessions of Convicts & Cthulhu might also be a possibility for curious shoppers. I’d love to hear any feedback from those readers who have managed to run “Fallen Stars” for their own group. You can always reach me at my email: mythologyprof at gmail dot com. This entry was posted on Tuesday, August 28th, 2018 at 11:23 am	and posted in Convicts & Cthulhu. You can follow any responses to this entry through the RSS 2.0 feed. « Ever Get Lost On The Streets Of Arkham?